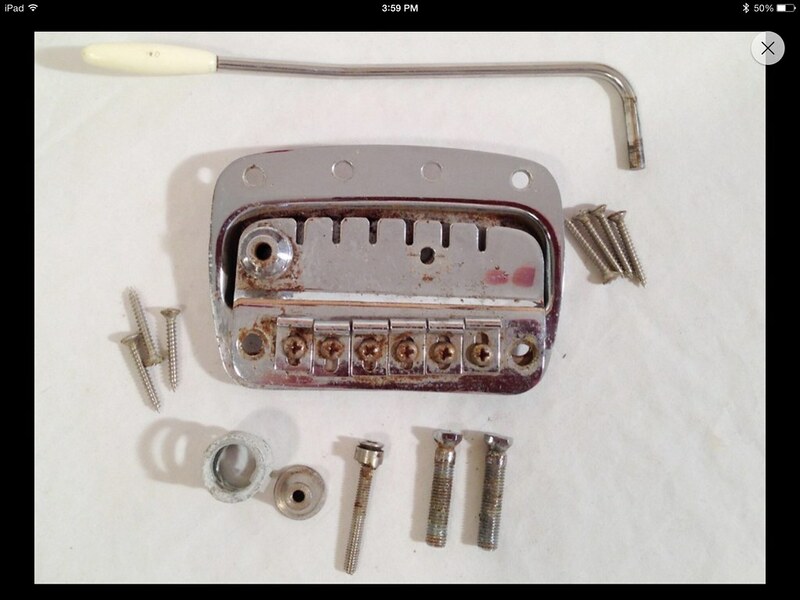 A couple of years back I picked a Bronco trem base plate (NOS) and trem spring. They have been sitting in my parts bin for a while and I honestly thought I would never have a chance to use them. I saw a top plate on ebay and bid on it knowing someone would come along and snipe it away. Turns out I was the only bidder. (missing 2 saddles and 2 more appear partially broken) I have never seen a top piece sold separately. My question is does anyone have any of these parts or know where I might come by them. I know it's still a long shot but I thought I might check and see if anyone has stuff laying around. it looks almost like you might be able to get some of those curved metal strat saddles and file off the back(where the screw usually goes in) and they may work, tho... the height difference may be an issue. Bronco saddles are very thin metal. Theses saddles could be modified and cut to a similar shape but would be too thick. Still could work. 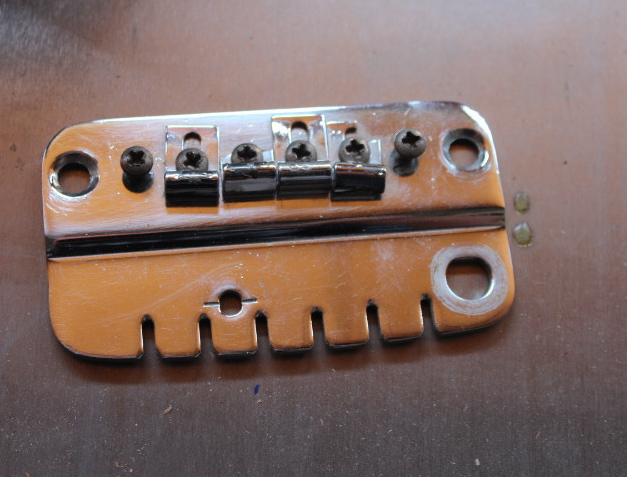 Minus the extra hole, this Squier Strat saddle could be cut to work. I bought a Bronco project off cooter a couple of years ago, he managed to get the trem assembled from parts. I think he used trem posts off a 2 post strat trem, the saddles off a danelectro bridge and a jazzmaster spring etc. 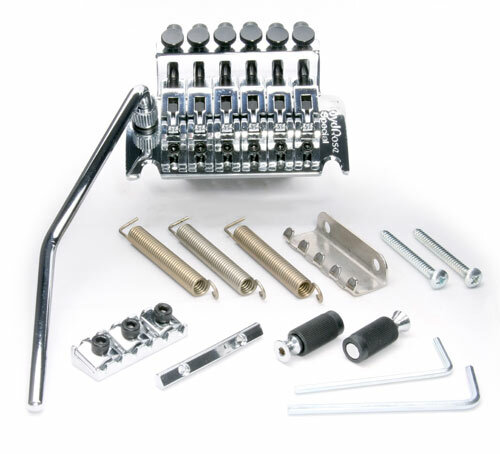 G&L sell a trem arm and collet that's pretty close to the bronco item. Danelectro Saddles These look thin enough and have string grooves. different heights to follow the 7.25" radius of the fretboard. The strat saddles might adjust perfectly. You can get these at the hardware store. You can also get the set screws that go in the trem collar at the hardware store but I didn't write down the size on those. I'm actually liking robert originals idea better than the dano saddles. The Bronco's stamped saddles come in three different heights to follow the 7.25" radius of the fretboard. 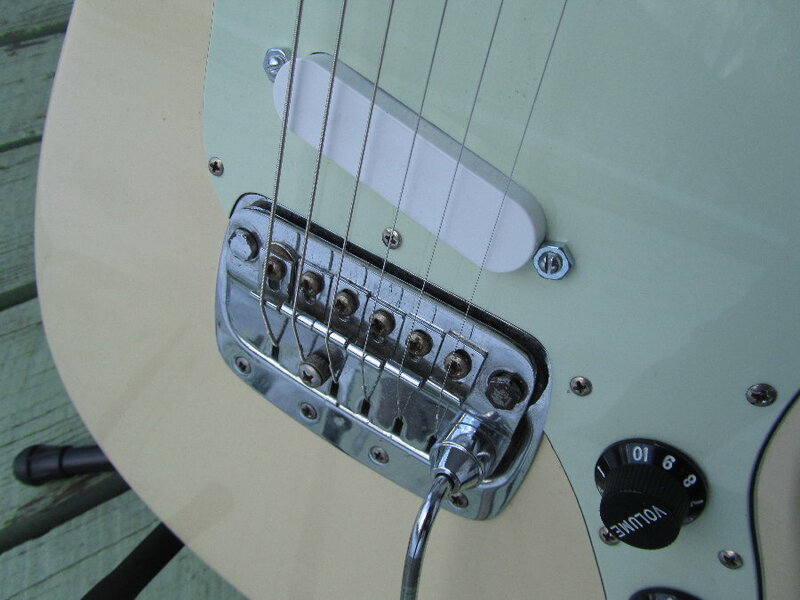 The strat saddles might adjust perfectly. If I cut off the back side where the height adjustment screws are, aren't all the same height? Are you suggesting something else? Yeah, I meant leave the end with the height adjustment screws and cut the other end off. I was originally thinking of Option#2 because it would look similar, but option #1 would fix the height adjustment issues. I could look at my Bronco and measure the height differences. I could do the Option #2 but I would have to put a thin spacer or shim under it to raise the height to match. Why don't you recommend the Dano saddles? Option #1. I haven't tried this but I think it would work better. In theory anyway. The Dano saddles are all the same height. I am assuming you would loosen the screw that holds down the saddles to allow the saddles room to move up and down. You can see the slight height differences in this picture. What do I do about the metal spacer on the top plate that the Spring screw goes through? You can see it behind the D String saddle. What did you use for the cone shaped spring retainer? What kind of Strat posts did you use? i was refering to option 1, and in reality you could measure it out and use a vice to bend the low e and high e saddles to the right height, as well as the a, and b string saddles, wilst keeping the d,g saddles at a "zeroed" height and used the ajustment of the plate itself to set it up the rest of the way. in my mind it would take a few hours to do all of them just right, but it would be worth it. and you could, most likely leave the set screws in and use them to get the radius, im not sure how long the screws are that hold them in place tho. cooter brought up a good point about the strat saddles being thicker, and the bronco saddles being rather thin. This picture helps me see under the hood a bit and most of the parts are labeled. 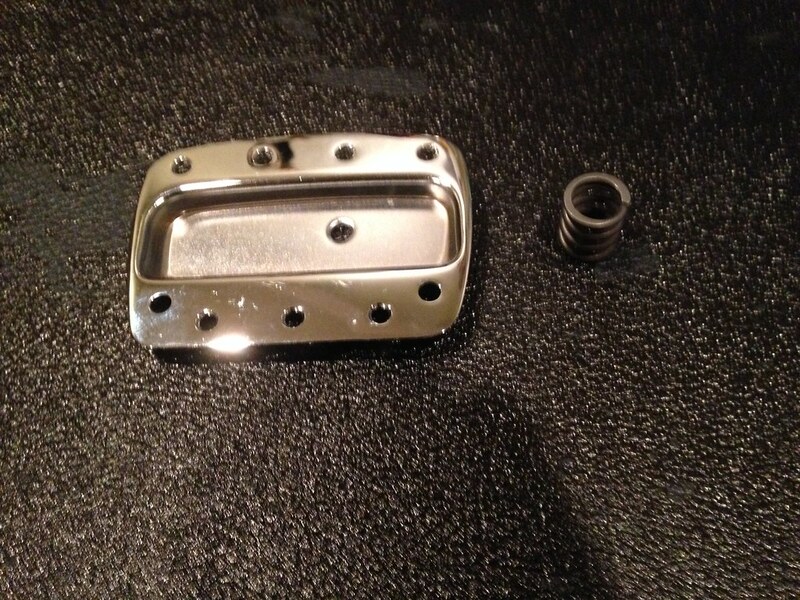 Does anyone pics of the trem collar when it's attached to the top plate from the bottom? Could I use a Spring retainer from a Jaguar to hold the spring up? Yes, I'll take a picture this evening. It won't work with the Bronco spring. The Bronco spring retainer is much bigger. That's surprising. I thought the Jaguar would be bigger. How did you get around that? 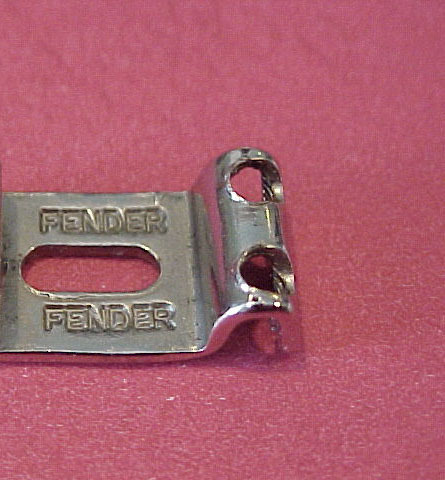 My trem has that piece but it looks like that would be pretty easy to make from a piece of the right size metal tubing. I haven't figured that one out yet either. 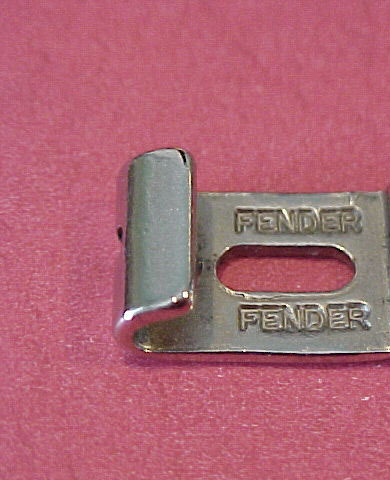 You can use a jag spring retainer but it won't work with a Bronco spring. You'll have to use a jag spring and they aren't as tall or as stiff. larger holes for the trem post bushing to fit in. But I was going to make my Bronco body so it wasn't an issue.